Very little in known about the greek scientist Philon (ca. 280–220 BC) (sometimes called Philo) of Byzantion (Greek: Φίλων ὁ Βυζάντιος). Byzantion is an ancient greek city (founded in 667 BC), a precursor of Constantinople, the capital of Eastern Roman Empire, and Istanbul of modern Turkey. The most information about Philon's life comes from the only work, which has survived (at least major parts have survived) at the present time—Compendium of Mechanics (Mechanike syntaxis). As in this treatise Philon writes about the catapult which was recently invented by Ctesibius of Alexanfria, thus we can date Philon fairly accurately and we know that he wrote his treatise Mechanics around 250 BC. In this treatise, Philon describes also journeys he had made to Rhodes and to Alexandria to study catapults. The text of Books 4, 5, 7 and 8 has survived, while the rest has been lost. Fortunately Philon has the habit of cross referencing fully in his work so we can learn quite a bit about what was contained in the lost sections by studying the surviving ones. 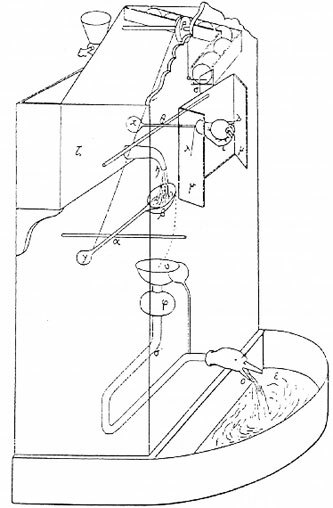 The book Pneumatica includes not only the first description of a water mill in history, but also the earliest known escapement mechanism, as part of a washstand automaton (see the image below). Unfortunately, the most interesting in the context of this site part of the Philon's treatise—Automatiopoeica, didn't manage to survive to the present time, so we can only guess what kind of automatic machines it describes. However, in Pneumatica is described also a human-like automatic device in the form of a maid, holding a jug of wine in his right hand. When one placed a cup in the palm of robot's left hand, it automatically poured wine initially and then poured water into the cup, mixing it when desired. How operated the machine? Inside the maid, there are two airtight containers (with wine and water). At their bottom there are two tubes, leading their content through the right hand to the lip of the jug of wine. Tow air pipes start at the top of the containers, go through their bottom and lead curved into the stomach. Maid's left arm is linked, through the articulation, to the shoulders, while a winding rod (spring), that is positioned in extension of the restraining rod raises it. Two pipes start at the same point (joint) and come down (going through and freeing the curved perforated ends of he air pipes). The pipes of the joint have two holes or tears at their ends, with the hole in contact with the container of wine preceding that, which is connected with the water container. When the cup is placed into the palm, the hand comes down and the tubes of the joint are lifted. The hole in one pipe is aligned with the air pipe of the wine container, air enters the container and wine flows from the tube into the cup. When the cup of wine is half full, the hand (due to weight) descends further, the passage of the air pipe of wine obstructs and the flow stops. At the same time, the other tube is aligned with the air pipe of the water container and it begins to flow, thus diluting the wine. When the cup is full, the hand (due to weight) descends further, the passage of the air pipe of wine obstructs and the flow stops. If the cup is removed at any moment, the left hand rises, the tubes of the joint descends, cutting of the air pipes, creating vacuum in the containers and stopping the liquid flow. The maid then fills the cup with wine or diluted water of desired quantity, depending on the time it is pulled from her palm. Philon's works had a great influence over the next generations of mechanics, and are mentioned as a source by many later scientists like Vitruvius, Heron of Alexandria, many Arabic scientists, etc.